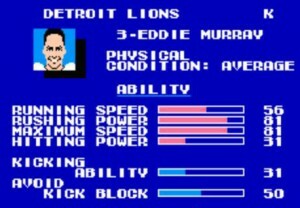 One of the rare Canadians who played in the NFL, Eddie Murray graduated from Tulane in 1980 and is most remembered for playing 12 seasons for the Detroit Lions after being drafted in the 7th round. A solidly consistent kicker -during an era of notable kickers, (Pat Leahy, Gary Anderson,Morten Andersen,Norm Johnson, Nick Lowry, etc) Eddie was amongst the best of them named to the ProBowl on numerous occasions and being named MVP of the game in 1981. Named to the NFL All 1980’s team, Eddie finished as 6th all time in scoring before retiring with 1594 points, (but as of 2010 he’s ranked 14th,) and is the highest scoring Canadian born citizen in the NFL record book. He was 238/275 within the 39 yard line and frighteningly effective from 20-29 yards hitting 92 of 98 field goals. After playing for the Detroit Lions through 1991, Murray would hop over to the Chiefs and Buccaneers for 1992, then over to the Dallas Cowboys winning a SuperBowl ring in 1993. It was here at training camp I’d get his autograph on 3 separate occasions at camp. He was a really gracious signer and would pretty much sign everything before and after practice. Amazingly after his one year stint with the Cowboys Murray just kept going, playing for the Eagles and Redskins one year a piece through 1995. It was thought he retired in 1996 but was called up by the the Minnesota Vikings where he kicked in 1997, the Cowboys again in 1999 and in 2000 for the Redskins before finally retiring after 21 seasons. He currently lives in relative anonymity in Michigan where in 2010 he was inducted into the Michigan Sports Hall of Fame.